Find out about the mysterious Force that powers lightsabers, meet the Jedi and Sith who wield them, and discover the tactics needed to win in a deadly lightsaber duel. The Star Wars Lightsaber Battles DK Readers 2 Paperback Book features amazing lightsaber clashes from across the entire Star Wars movie saga as well as the popular animated TV series Star Wars: Rebels. It explores the adventures of Rey and Kylo Ren, Ezra and Kanan, Obi-Wan, Darth Vader, and more as they use their lightsabers in fierce battles. 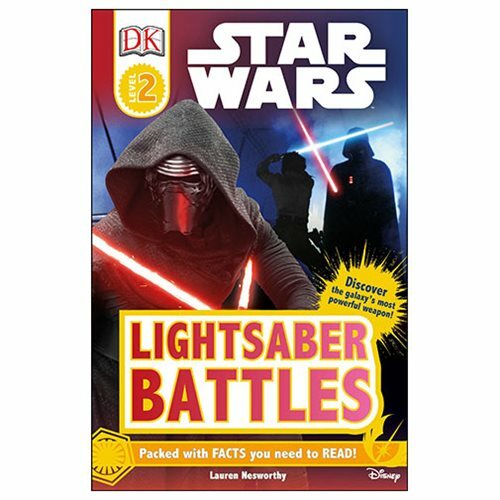 Take a closer look at lightsabers and their incredible powers in this fantastic Star Wars Lightsaber Battles DK Readers 2 Paperback Book. The 48 page paperback book measures about 9-inches tall x 5 9/10-inches wide.